I sit outside at a picnic table; our RV looms behind me cradling our two knackered toddlers, and in front of me the dense Rocky Mountains are in shadow as the last of the sunlight fades. A cool breeze carries the earthy smells of a nearby fire and the sounds of laughter. Finally, I have found a peaceful evening to write, but it feels like the prolific memories are bottlenecked as they fight their way out of my head. I have so much to share… all week – each day – I’ve imagined what I will write, but once the kids are in bed, and necessary cleaning and bookings for the following days complete, I fall into bed completely zonked. Don’t get me wrong- we are having a blast! Our adventures (and misadventures) are full of humor and laughter, but I am exhausted! Yet I must dump these memories out of my head before it explodes! I woke up the day of our scheduled departure stressed and with a migraine. Still so much packing to do! My stomach was tightly clenched, as it had been for days. But once we finally pulled out of our driveway, I felt a sudden release of stress and migraine pain and excitement/anticipation replaced my nerves. Our first stop was only 30 minutes away at Stone Mountain. We strategically decided to stay there because it was close to home and to the dealership/service in case any last minute stuff came up or if we forgot something worth driving home for. We also wanted to have a final test run with my parents and a chance to say goodbye. They met us there about 4pm and chaos ensued. We took the kids to the playground, grilled a yummy dinner of salmon and veggies, enjoyed a lovely bottle of Amarone, walked to the lake and then relaxed by the fire pit (even though it was the worst wood ever). Stone Mountain State Park: 4 stars – lots of amenities, decently spread out, kid and dog friendly. Scenic, level, full hookups. It was an early morning – London was teething. There was more chaos as we tried to enjoy coffee and manage the kids while simultaneously packing up. It felt hectic, perhaps even more hectic, with my parents with us – weird because we had extra hands to help! My dad and I took my parents’ car to our house to pick up a few forgotten things, like the baby monitor so we can feel more comfortable hanging by fire pits as the kids sleep inside, and I also decided that I couldn’t go 3 months without my Vitamix (only those of you with a Vitamix will understand this City Slicker luxury). Anyway, I was so glad we were still close to home! 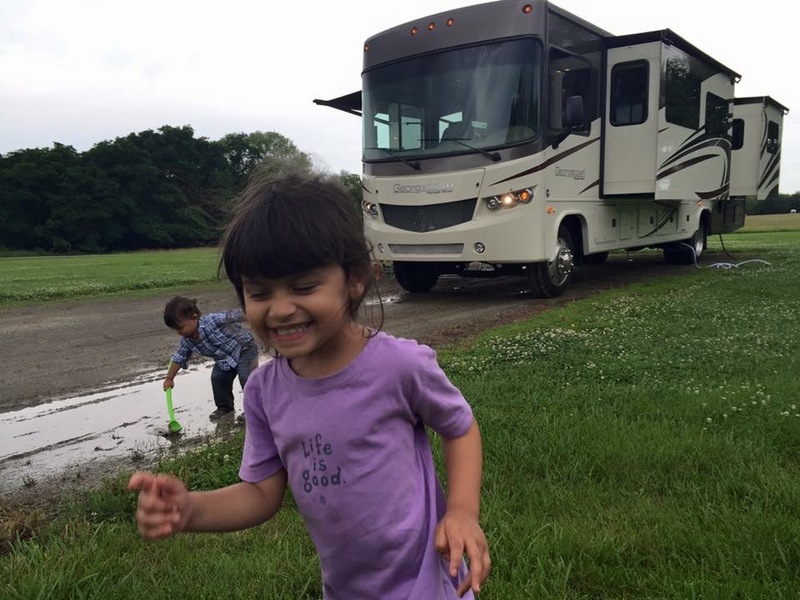 Then Dad and I picked up Zoe’s Kitchen and we met Raj, Mom and the kids near Perimeter, where we ate comfortably inside the RV parked in the exotic Best Buy parking lot! Saying goodbye to my parents was tough – we know the kids will miss them terribly. Then we proceeded to sit in awful I-285 traffic. THEN, we got a call from my mom that her keys were with us in the RV! Uh-oh. Luckily I realized we were quite close to her fr iend, Debbie, and we arranged to meet her off the highway and give her the keys. Then more traffic… ugh… we started to realize we may not make it to our first goal of Nashville. Oh well – I was feeling Zen and the scenery was beautiful. We didn’t have reservations anyway, so I called a couple places and reserved a spot an hour south of Nashville, in Manchester, TN where Bonaroo was going on. We arrived in time for a pretty sunset, had a tranquil view overlooking a field and barn, gave kids a quick dinner and went straight to bed. Whispering Oaks: 4 stars for potential- 3 in actuality. Very friendly new owners – they have plans but don’t seem rushed to implement – overpriced for what was there. Paid $43 for full hookups/ 30Amp. Morning was still chaotic but a bit better. Felt like we were getting the hang of things little by little. But London was up at 5:40am from time change and teething combo. Took kids to the playground (which was lacking) then hit the road. It was a long day of driving because we wanted to make up the extra hour we lost the day before. We successfully made it to St. Louis, MO and stayed in a suburb on the NW side so we could miss any morning traffic. We were very disappointed with the campground- it was basically a parking lot with patches of grass in between. Not our idea of camping! Amazingly, our “neighbors” there said they’d been there a month and were loving it! Different strokes… The kids were a mess, and a storm was moving in, so we let them play while we grilled sausages, asparagus and peppers. We attempted to feed them and then it took forever to get them in bed. By the time they were both asleep, we agreed it was our turn too. Sundemier: 3 stars for being clean and having full hookups, but not our thing. Too much concrete, too close together, and though we only arrived 7 minutes after 6, they did not leave a packet for us as indicated so we did not have access to amenities. Drove through Kansas City and into Kansas. Parked at Clinton State Park. We took our time finding a good spot in the beautiful park, with beautiful peek-a boo views of a lake and surrounded by wide open fields. However, our first attempt at choosing a site, I hopped out to guide Raj b ack into the spot, and cicadas immediately swarmed me. I must have given some campers a good laugh with my city slicker moment of jumping around and shrieking! I’m not afraid of cicadas – they are like a cross between a moth and grasshopper (IMO), but there were a lot of them in the trees of that site and they were LOUD and were dive-bombing me and landing all over me and the RV – it was intense… and funny… to anyone watching. I’ll figure out how to upload a video so you can hear them!) We ended up in a perfect spot with fewer trees and less cicadas. We enjoyed a peaceful night of watching the kids running in the fields with the dogs, and I cooked a lovely meal of salad, green beans and Tilapia, which we ate in courses because I’m still figuring out how to cook in my little kitchenette. We were all happy to settle in for more than 1 night, and in such a beautiful spot – it felt great. Clinton State Park: 4 stars at least. It would be 5 stars if they had on-site sewer and if the hiking trails were a bit better. It had been raining there for a month so there was some water pooled in areas, but not bad considering. Very beautiful, spacious, lots of options for sites of different levels, many with peek-a-boo views of lake, choice of some with shade, in the open, or more wooded, very clean sites and well maintain ed landscaping, though the one bathroom we used on a bike ride wasn’t fabulously clean and the playground/picnic had some trash. Saw deer a couple times. 2 nights. The kids actually slept in a bit. I took the dogs for a long walk in perfect morning weather and solitude, and a deer bounded across our path within 25 feet! Then we all went on a nice bike ride and found a playground. Clinton Park reminded Raj and me of Richmond Park in London. After a lovely morning, we faced one misadventure after another. First we got all set to go for a hike to the lake, but within 5 minutes, Raj, with London in his backpack, slipped in mud and landed ON Nina. Her back was scraped up and he had a cut on his arm, so we returned to the RV to doctor them up with some essential oil concoctions. They were both fine, but we lost momentum for our hike. Instead, we had some laughs and some lunch and got kids down for a nap – and they both napped at the same time! Yet before we could also nap or be productive, my laptop slipped behind the bolted down pull out sofa and it took an hour of trying to get it out before we finally just cut a slit in the backing. I wish we somehow had pictures of the awkward positions we were in as we struggled to get under the pulled out sofa. We laughed through the process but it was also very frustrating and had us both in need of chiropractic or massage care. My mouse-pad was cracked, but otherwise my laptop survived the ordeal – nothing a little duct tape couldn’t fix (right, dad?). Next we realized that we had taken a reserved site the day before and began to worry about where the other campers had ended up and whether the camp host would be knocking soon to kick us out. I took a short nap and once the kids woke up we tried again for that hike, this time with proper shoes/gear. It was very disappointing so we cut the hike short and went to a playground. Around 6pm, we walked “home” for dinner, which I had thrown in the crockpot earlier (chicken with broccoli). Then we found 2 ticks on Nina and 3 on Raj. YUCK. Especially after the hikes and knowing ticks were a real possibility, I desperately wanted a shower, but realized that our Grey tanks were full (no sewer at this site). So, not only did I not have a chance to wash my hair, but I had to leave the kitchen sinks full of dirty dishes. I was spent anyway, so we planned to get up early and go to dump station on our way out of the park. I was grateful the day was over and sleep came fast. A rough, early morning; London woke up mad at the world. We skipped our planned walk and packed up to go. Kids were rough but Raj and I had it a bit more together. Spent 50 minutes at dump station (first time – previously our slots had sewer on site) dumping and filling up and washing dishes and putting them away for our 5 hour drive across Kansas. I knew Raj wanted me to drive for the first time. In fairness, I had said I would try once we were in the-middle-of-nowhere Kansas, but I was very nervous. After about 2 hours into our drive, I offered and Raj immediately pulled over onto the shoulder! I wonder if he thought I’d change my mind if he didn’t get me in the driver’s seat fast? In any case, I did it! No problem really. It took a bit to get comfortable and it was quite a bit of concentration and attention, but I was fine with it. I drove for about an hour 15 minutes. When we arrived at the State Park in Western Kansas late afternoon, we found a nice spot but it wasn’t 50amp as advertised (30 amp is fine for us – it essentially just means we can only run the front OR the back AC units… Oh well, not a big deal – there was a heat wave but we made do. We went for a nice walk down by the water, and it was lovely in the shade but quite hot in the sun. They had a lame playground but at least it was in a pretty location on the lake. London fell down and got some scrapes on his face and ear so I cleaned him up then started dinner. We ate outside as the sun set – ground turkey and kale on rotini for Raj and kids and on a salad for me. That night I finally got a long shower – bliss! Then I spent all night at the dinette with Raj mapping our route and making as many booking as we could until we went cross-eyed. Felt so good to make so much progress! This was the sort of stuff that RV travelers generally do months in advance. Apparently, we are not typical! Lake Scott State Park: 4 stars – beautiful, unique, not crowded and laid back. Lovely scenery and historically and geologically interesting. Playground was lame and there was trash around, but not horrible. Lots of bunnies and beautiful birds – lots of lots of geese, and well, their poop. Lovely tranquil place. Would stay again. Stella woke us up whining and Raj had a headache so I took the dogs on walk (L was up and contentedly singing Twinkle Twinkle in his bunk). As I stepped outside with the dogs, the sun was just coming up over the bluffs and the lighting was beautiful. I was looking up so I didn’t immediately notice the 50 or so geese who were hanging out 20 feet away; they left in a hysterical panic at the site of the dogs – oops! Sorry Geese, didn’t see you there! We walked by the lake, saw a couple bunnies and gorgeous electric blue and also yellow/black birds and I listened to the owls greet the day. Very tranquil. Once back at the RV, we ate a quick breakfast of yogurt and berries then carried our new inflatable kayaks down to lake. So heavy! I took the kids to the playground while Raj worked on blowing them up but it took so long we ended up all cramming into one. The kids weren’t too pleased by the time we got out into the middle of lake. We were in the quiet morning air, in the middle of a lake, and the kids were screaming bloody murder. Not fun. We cut it short and went back. The set up was way too much trouble for a quick run; next time we’ll have to be staying in a place a while to bother blowing up the kayaks. We decided to get moving and make it to Colorado. Unfortunately, with all the reservations we were able to acquire, we were still struggling to secure the following 4 nights! Once on the road, I got lucky with the 2nd place I called and at least got us the first 2 nights. Then I realized we needed to book rental cars. GRRRR- that type of research is so not my thing, and I was shocked at how difficult it was to find anything available! 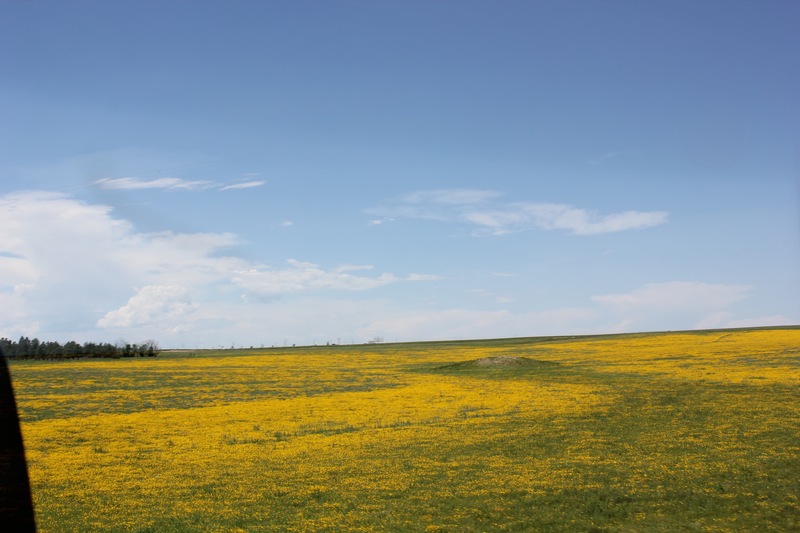 As I researched with limited service, we drove for hours on crazy rough roads, seeing nothing but ranch land, occasionally yellow wildflowers, cows, horses or dust-bowls. Then finally, mountains in the distance! We arrived to find our RV park was excellent and very service oriented. It was well designed and well maintained. A ridiculously strong hail storm came through about dinner time right after we returned from the dog park and playground and washed away quite a bit of the crushed stone/gravel that made up the roads and sites, and created rivers of erosion. They had bulldozers out first thing the next day fixing it up. It was impressive. We were very happy to be in a nice RV park, especially with making a last minute reservation, but its location was south of Colorado Springs and away from the places we wanted to visit, like Garden of the Gods. We tried to rent a car but found they were completely unavailable! Then Enterprise found us a car for the next day but said we were too far from them to come and pick us up. So we got the kids in bed (an hour early because of time change) and decided to start booking cars for down the line in our itinerary and over and over again we found that ALL the cars were booked. WTF? We knew there would be times it would be inconvenient, but didn’t expect it to be this much trouble, so we started discussing our back-up plan of buying a vehicle to tow behind Gypsy (we officially named our coach!). Mountaindale Cabins and RV Park: 4.5 stars! What a lovely, beautiful, service-oriented place to stay! We were so lucky to get a same-day reservation for 2 days here. They were friendly, accommodating, guided us to our spot, carried our firewood for us (in their fancy 4×4 golf cart things) and maintained the grounds meticulously. An incredibly strong hail storm blew through and washed away a lot of the crushed red stone/gravel – we were impressed that 1) during the storm, the employees went around in the hail to advise owners to bring their canopies in, and 2) by 2pm the following day, they were already done with grading and leveling all the eroded areas. The only reason we gave this less than 5 stars is that there is nothing within a walk or bike drive to explore. The park itself if self-contained, but venturing out requires a drive, and likely a 30+ minute one. So there you have it – our first week! We knew the first week would be among the hardest (at least u ntil homesickness settles in or if mechanical difficulties or illness strikes) because a) we don’t know wtf we are doing yet, b) we have yet to find our groove, c) our kids are too young to understand what’s happening, and mostly, d) we had to travel for long stretches of 4-6 hours nearly each day to get to Colorado where we felt the adventure would truly begin. Well, I hope we were right because it was indeed a tough week! But it was also a week full of experiences, adventure, learning, beautiful sites, and a sense of togetherness. In essence, tough, but good. P.S. I planned on writing about what it was like to prep for the trip, and I hope at some point to be caught up enough to circle back to that, especially for those that either want to attempt a trip like this or just want a good laugh! For now though, the on-the-road adventure is fresh and exciting! Thanks, Erin! I look forward to following your adventure and learning from you, as you have a couple months on us! We don’t intend to go full-time long term, but we still need to get it together for this 3-4 months! Yeah, I certainly create more work for myself, and my husband would likely be just as happy with sandwiches for every meal, but I enjoy it and think it’s important. Send me ideas though for quick meals after long days! I love it!!!!!!!!!! You’ll look back on these adventures and not trade them for the world!! My advice?? Relax into it………let it all go. A month or two of fast food or microwaved pancakes for dinner never hurt anyone permanently. Break the rules. Live for the moment. Watch the stars. You ARE living the dream right now. You’ve got everything you need with you…….your family. I’m so happy for you! Thanks for following Michele! Great advice! I am always working on being present in the moment. This trip is really good practice! We spent Father’s Day with your parents who are missing you. You’ve taken on quite a lot. Thanks for sharing your experiences. we think we have demoed out. Best wishes for your continued adventure.